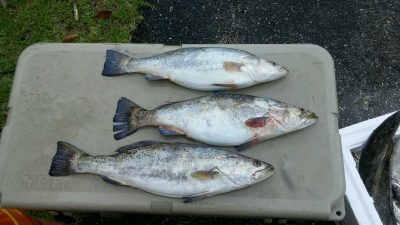 We are just into May and the speckled trout are running. May, June and July are by far the best time to fish for specks in Louisiana. They began entering our estuaries in April like invading mongols on a mission to EAT. This is their spawning season and they are looking to build up some energy by feasting on crustaceans and small fish. 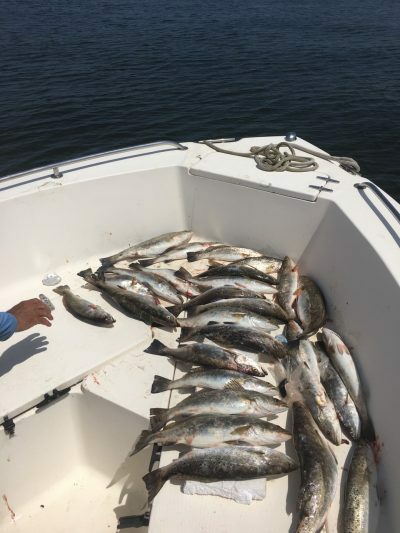 Schools of speckled trout (also known as spotted sea trout, spots, specks, yellow-mouths, and paper-mouths) will chase food from the barrier islands south of Cocodrie up throughout all of the coastal bays and bayous from now through the summer. If you like catching fish, this is the time of year to catch your limit on this fun and tasty game fish. On Wednesday, we put in at Venice, LA. As many of the real fishermen in Louisiana already know, Venice is considered one of the best destinations for fishing in the country. We went down to the place called “the rocks” at the end of the Mississippi River Gulf Outlet (MRGO or Mister Go as it is often called). The moment the first shrimp hit the water, the cork followed it straight down and I landed a beautiful 16″ trout. I caught six more that were generally the same size just about as fast as I could catch them. After back-to-back catches for about 15 minutes, they stopped biting. It was nothing gradual either. One moment it seemed like the fish were lining up for shrimp, and the next moment, if those fish had noses, they would most assuredly have been turned upwards because they did not like my shrimp any longer. Once the specks stopped marauding my shrimp, I finally got a moment to pop open a cold drink and watch what was going on around me. I had been fishing close to the rocks, but about 30 feet out from the pile of rip rap, I could see the faint rippling of the water telling me that the bait fish were moving in with the tide. Using the trolling motor, we idled out along the rocks and put about 20 yards between the rocks and the boat and began drifting with the current of the incoming tide. Drifting for speckled trout is a time-worn method where you let your boat move with the current or breeze and slowly “troll” across the point that you have determined to be the ground zero for specks. Some people argue that you should only drift fish on a cloudy day so that the fish are not spooked by the shadow of the boat passing across their school. I have been told that even if the speckled trout are spooked and dart away that they will regroup quickly enough and continue feeding. Monday was a beautiful sunny day. Any shadow the fish might have seen did not hurt our catch at all. When we were positioned and cut the motor, I switched over to my jig setup with an artificial shad. Casting into the bait pod and reeling it back through the schools of minnows did not work at all, so I tried to tease the fish with a bit of a “drop and pop” motion. This did the trick because it drove them crazy. 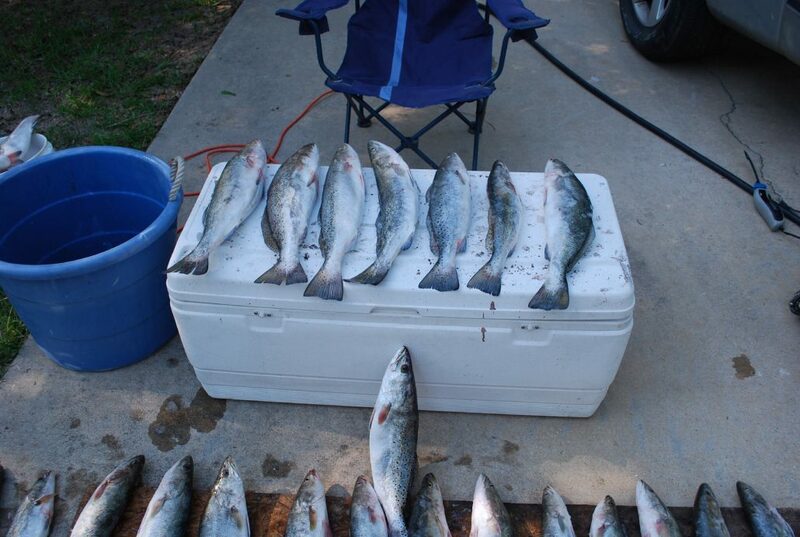 Over the next two hours, I caught my limit…twenty-five beautiful, delicious specks. Several were between 18” and 19’ long, and the biggest at 20 inches was right at three pounds. This time of year, you usually only have to present a small assortment of bait to find what they are biting. They may not want the first bait you present, but the motivation to eat during the spawning season is imprinted on their DNA, so try the next bait until they bite. Good choices for live bait are shrimp, small crabs, cacahoe minnows, bull minnows, croaker, pinfish, mullet, pogie or any similar sized fish. Shrimp is the most widely used and available, by far. I usually choose about a 2/0 hook and 12 pound test line just in case I hook into a “gator trout” which is what you call one of those “toothy” specks that over 25 inches long, about 8 or 9 years old and beginning to resemble an alligator. I keep a variety of lures in my tackle box for bringing home speckled trout. These are made up of an assortment of plastic minnows and jig heads, split-tail beetles with spinners, crank baits, spoons and a few popping corks. Besides being a haven for speckled trout, the rocks at the end of MRGO are home to jacks, redfish, drum, sheepshead, ladyfish, and sharks. Most anglers launch in Venice to make the run of just over twenty miles to the rocks. While fishermen can be seen at the rocks at all times of the year, the fishing this month is the highlight of the year for specks.